If you’ve been watching the news over the past year, then the chances are good that you’ll have seen a report about how we in the UK are far fatter than we ought to be. The reason for this might seem obvious: we take on board more energy than we consume, and the difference is stored as subcutaneous body fat (that’s the stuff that’s stubbornly lingering around our bellies, bums and thighs). Once upon a time, blame for this was attached to fatty foods like pastries and sausages. But the ire of medical professionals has now fallen on a new bogeyman: sugar. While few of us would place sweets in the same ethical category as a lamb chop or a Big Mac, it must be recognised that many sweets contain traces of animal product and so vegetarians will want to avoid them. Among these animal products, the most often-cited is gelatine; a jelly-like substance which helps to keep marshmallows plump and jelly babies juicy. Gelatine is a protein found in bones, cartilage, tendons and skin and since few people want these parts of the animal in their dinner, gelatine is inexpensive and widespread. But gelatine isn’t the only animal substance you’ll find in a pack of sweets. Carmine, for example, is a sort of red food colouring created by mashing up insects. This doesn’t mean there aren’t sweets out there that vegetarians can enjoy! 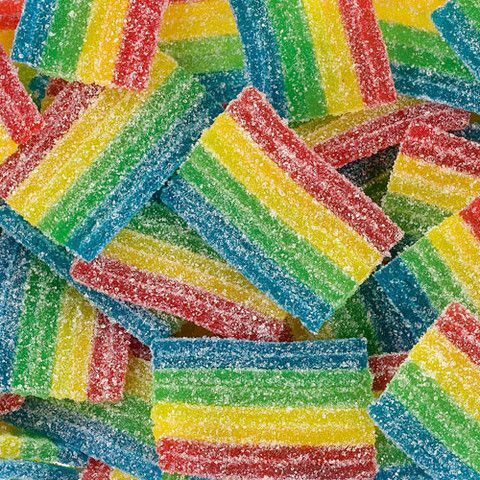 Check out this list of vegan friendly sweets from PETA. There’s loads of our favourites on this list! Which sweets are gluten free? Gluten is a form of protein found in several sorts of grain, which has a tendency to linger in your gut, irritating the microvilli (tiny, fleshy pillars designed to maximise the surface area, and therefore digestion). When these microvilli become inflamed, the result is nausea, fatigue, nutritional deficiency and a host of other digestive problems. Every year, thousands of Britons are diagnosed with gluten intolerance – and many thousands more experience the symptoms, but have yet to get properly tested. The good news is that many sweets, like chocolate, don’t contain gluten. That said, even if gluten isn’t listed on the ingredients, it might still be present in small quantities due to contamination at factory level. For particularly sensitive suffers of coeliac disease, it’s worth trying just a small sample of a suspect foodstuff at first – that way any side-effects can be minimised. What sweets can I eat on a diet? Foods containing high amounts of fructose or sucrose (ordinary table sugar) will contribute to weight-gain – both directly through the calories they contain, and indirectly by impacting the body’s production of ghrelin, a hormone which governs appetite – making it harder than ever to cut back on those calories. The problem with sugar is that it’s hidden everywhere in absurd quantities – in everything from mayonnaise to orangeade. The solution here is to eat whole foods wherever possible, and enjoy sweet things only as an occasional treat. That way, when you do indulge yourself, it’ll taste all the sweeter. And what better occasion could there be for indulgence than at a wedding! The NHS advise that we get around thirty grams of added sugar in our diets every day – which is around the same amount that you’ll find in a Mars bar. For children, the limit is lower – around 19g for children under six, and 24g for children under ten. Naturally, this is an average, and there are certain occasions where it makes sense to relax the rules slightly – such as a wedding, birthday or Christmas celebration.